Small field — projected slow pace materialized – modest pressure… equals upset. As we warned in analyzing the chances of Irap… our Super Screener top long shot play who won at odds of 31-1 in the 7 horse field. We covered for this possibility in an Exacta ticket, but paired Irap with Practical Joke instead of slotting the latter foe “under”…ugh! Glad to hear some of you had not only cashed on the big win but the gargantuan Exacta as well. The Super Screener gave Irish War Cry one shot to redeem himself after his complete flop last out in the G2 Fountain of Youth and redeem himself he did. It was a sharp looking victory as he behaved kindly, rated off the pace and then took command in the final furlong and draw away, convincingly. Take nothing away from Battalion Runner who did all the work dueling throughout but continued on to hold second. Cloud Computing ran a respectable race finishing 3rd and picked up enough points to make the Kentucky Derby gate if connections decide to proceed. Though another chalky finish a Super Screener suggested Exacta wager paid a couple of hundred dollars. This was the largest, most contentious field of the entire Derby prep trail and in the history of the Santa Anita Derby. It was a very wide open affair and while the Super Screener top win pick, Reach the World, ran gallantly covering a lot of extra ground (having been pushed wide in the turn) finishing a fast-closing 4th…it just wasn’t enough. Tip of the hat to trainer John Shireffs who rights both of his previously highly regarded charges with Gormley winning the race being taken off the pace which did the trick. His stablemate, Royal Mo ran a good one as well and held on gamely for 3rd holding off the aforementioned, fast-closing Reach the World. What will get lost here in the aftermath is the tremendous race run by Battle of Midway. He dueled every bit of the 1 1/8 mile distance and yet would not relinquish 2nd place. Very impressive effort here and he fulfilled on the Super Screener top board hitter designation. Wow! What a wide open Kentucky Derby this year. There has been no horse to date that has really just jumped up as the clear favorite. 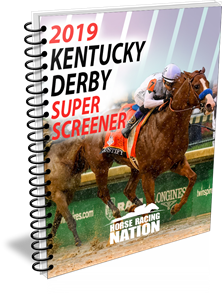 The Super Screener has some early favorites that are not among what will be the race time favorites come the first Saturday in May. And then there was one! The Arkansas Derby is the final major Derby prep of the year and it promises to be another show stopper. Lots of other Stakes action next weekend as the beloved Keeneland meet continues. Until then…Go fast and win! Always Dreaming Tops Kentucky Derby 2017 – Results! Kentucky Derby 2017 – Who Will Hit The WIN ZONE?